Echocardiography devices are used to carry out the process of echocardiography, consequently generating an echocardiogram or a cardiac echo. Simply said these devices are used to form a sonogram of the heart. Echocardiographic device use standard two-dimensional, three-dimensional, and Doppler ultrasound to create images of the heart. Echocardiography was also the first ultrasound subspecialty to use intravenous contrast. Echocardiography is performed by cardiac sonographers, cardiac physiologists (UK), or physicians trained in echocardiography. With rising number of cardiovascular issues all over the globe owing to unhealthy lifestyles, smoking, pollution, and other factors, echocardiograph devices are witnessing extensive use. This has furthermore led to the existence of a distinct echocardiograph devices market. Thus, echocardiography devices are now routinely used in the diagnosis, management, and follow-up of patients with any suspected or known heart diseases. Echocardiography is one of the most widely used diagnostic tests in the field of cardiology. It can provide a wealth of helpful information, including the size and shape of the heart, pumping capacity, and the location and extent of any tissue damage. An echocardiogram retrieved from the devices can also give physicians other estimates of heart function, such as a calculation of the cardiac output, ejection fraction, and diastolic function. Echocardiograph devices can help detect cardiomyopathies, such as hypertrophic cardiomyopathy, dilated cardiomyopathy, and many others. The use of stress echocardiography may also help determine whether any chest pain or associated symptoms are related to heart disease. The biggest advantage associated with using echocardiograph device involves then being non-invasive and has no known risks or side effects. An echocardiogram derived from the devices can create ultrasound images of heart structures, but it can also produce accurate assessment of the blood flowing through the heart by Doppler echocardiography, using pulsed- or continuous-wave Doppler ultrasound. This allows cardiovascular specialists to conduct assessment of both normal and abnormal blood flow through the heart. Owing to a telling prevalence of cardiac diseases and the clinical implications entailed, there has been a dire need for reliable, accurate, and fast diagnosis to come in close proximity with the status of the patient’s medical condition. Apart from physical examination and medical history, tests such as echocardiography find critical application in cardiovascular disease diagnosis. While a prime level of precision was only available with invasive techniques, echocardiography devices have turned the tables by providing equal or even better precision levels during the diagnosis of cardiac diseases. The world echocardiography devices market is anticipated to grow at a steady pace during the forecast period 2017–2025. The aggressive rise in the occurrences of cardiac disorders could be a leading cause of the growth in the world echocardiography devices market. According to healthcare experts, hypertension is the number cause of cardiac disorders such as heart failure. Hectic lifestyles promoting sporadic physical activities, intensified stress, and unsound dietary habits are some of the common reasons for heart-related diseases. As the number of cardiac disorder incidences increase in the U.S., the need to diagnose, treat, and monitor the acuteness of disorders and maintain medical records is expected to increase proportionally. Additionally, the rising hospitalization of geriatric population to receive treatment for cardiovascular diseases has augmented the need for echocardiography diagnosis. As a result, the world echocardiography devices market is predicted to propel at an impressive rate. Integration of newer technologies is another factor elevating the demand in the world echocardiography devices market. For instance, the advent of novel technologies in cardiovascular disease testing has boosted the sale of echocardiography devices. Secondly, both patients and equipment can now be flexibly placed in medical examination rooms with the perpetual advancement in wireless data systems. In Brazil, a group of Zika-affected babies were medically assessed with echocardiography to find minor heart defects. After the evaluation, the congenital heart disease (CHD) rate was found to grow three times than expected in the babies. However, merely one infant showed symptoms while most others revealed minor septal defects. This was the first time CHD has had a connection with the Zika virus in infants, although pericarditis and myocarditis have had been previously associated with flaviviruses such as dengue. North America could be at the forefront of the international echocardiography devices market in terms of technology. In the foreseeable future, the international echocardiography devices market is prophesied to be heavily influenced by technological advancements. Vendors operating in the North America echocardiography devices market could be encouraged for more innovation with the constant digitalization of data in cardiology departments and physician offices. As a result, cardiovascular information system (CVIS), picture archiving and communication system (PACS), echocardiography management systems, and various other kinds of management solutions are prognosticated to receive enhanced data connectivity. Asia Pacific and Europe, the Middle East, and Africa could be other key regions of the international echocardiography devices market. Schiller, Philips Healthcare, Nihon Kohden Corporation, Hill-Rom, Inc., and GE Healthcare are envisaged to lead the ship in the worldwide echocardiography devices market. In order to improve their shares and secure their position in the worldwide echocardiography devices market, players could consider competitive pricing and adoption of several strategies. 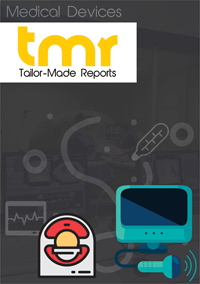 The worldwide echocardiography devices market could hold a fragmented characteristic on account of a multitude of regional and global companies making their presence known in the industry.